City of Bones Cassandra Clare Sci Fi. Book is in good condition, all pages intact. Ordinary New Yorker finds herself pulled into a hidden world of the occult when she witnesses a group of secretive demon hunters dispatching a monster in an alley. Her situation escalates when she falls in love with one of them, and is targeted by their fiendish enemies. 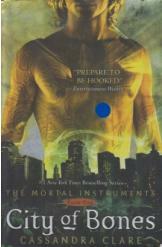 Book one of the "Mortal Instruments" series.